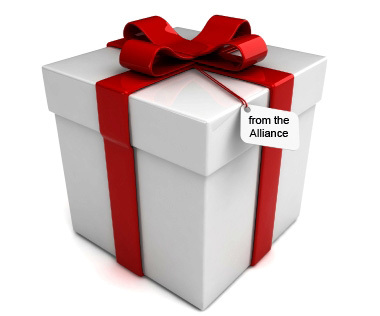 The Alliance is kicking off the season of giving by sending each of its members an early Christmas present. This week each member society will be receiving the complete results of our recent consumer research project – from a hard copy of the PowerPoint presentation with a synopsis of the findings to a DVD containing the footage of all four focus groups, so you can hear real consumers share their views on the fraternal concept firsthand. We think this is one of the most valuable gifts we can provide member societies, because the insight into consumer opinion on the pros and cons of fraternal benefit societies is, quite frankly, priceless. This initial round of research will help every member – from the largest to the smallest – improve their sales, marketing, and public affairs efforts by avoiding the pitfalls that turn consumers off and by focusing on the positive aspects of the fraternal concept that have genuine appeal to prospective members. Associate members also will be receiving the results, complimentary, and we hope that you find ways to discuss and use the research with your fraternal clients. The research results are even more valuable if you share them – with your management team, with your board, with your local chapter leaders, and – most importantly – with your sales force. The Alliance is more than willing to assist you with this by presenting the results of the research at your board meetings, conventions, or agent gatherings. Just let us know when and where you would like us, and we’ll do our best to be there. We’re hoping to deliver this gift to you by Easter of 2012. There is only one item on my Christmas list this year: the renewal of your society’s membership. We’ve worked hard over the past year to make your membership more valuable – the consumer research being one example of this. We’ve also taken steps to make our advocacy programs more effective, to enact public policy initiatives that protect consumers and enhance the awareness and reputation of fraternals, to expand the variety of education and information programs we offer to member societies, and to provide more cooperative programs – such as Compliance PLUS – that both save members money and improve their operational performance. And we’ve got even bigger plans for the future. But to accomplish that mission, we need you. So when you receive your renewal notice in the next couple of weeks, we hope you’ll not only make the decision to continue membership in the Alliance, but also to be a more engaged member by participating in an educational program, serving on a task force or committee, taking advantage of our professional liability and compliance programs, and using the results of the consumer research to grow your society and the fraternal system. We’re in this together, and if we stick together, the future for fraternalism is bright. Your wish is granted – we will renew our membership. Thanks Joe for coming to our convention in August and relaying the focus group findings on to our members. The results hit home with many in attendance as we have heard numerous comments about your speech. They WERE listening. The research is very interesting. Thank you to everybody who worked hard to gather the information. This should be helpful to us all.